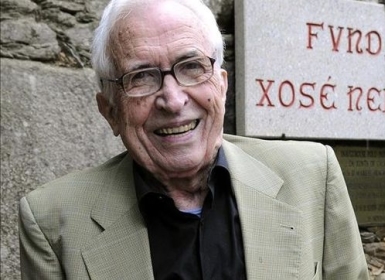 Xosé Neira Vilas (1928-2015) had a rural upbringing. At the age of 21, he moved to Argentina, where he entered into contact with important Galician cultural figures and founded the publishing house Follas Novas. He married the writer Anisia Miranda and together they moved to Cuba, where they remained for thirty years before returning to Galicia in 1992. His book Memoirs of a Peasant Boy is one of the most successful novels in the history of Galician literature and forms part of a trio of novels (Memoirs of a Peasant Boy, Letters to Lelo, Those Years of Moncho) that reflect the rural world and emigration through the eyes of a child. The same themes are seen through the eyes of an adult in People on the Wheel, The Iron Woman and Dear Tomás. The rural world and emigration characterize his extensive works of adult and children’s fiction. Memoirs of a Peasant Boy (148 pages), first published in Buenos Aires in 1961, is one of the first best-sellers of Galician literature, having been translated into some twenty languages and sold more than half a million copies. It tells the experiences of a peasant boy, Balbino, the son of a tenant farmer growing up in the rural Galicia of the 1930s and 1940s.